I didn’t expect my rant would strike such a nerve, but maybe I’ve been holding my tongue for a long time. Thank you for the many responses, online and off, both supportive and challenging. Participation in open data is both about the arcane topics of data licensing, and simply and most importantly being a good citizen. The impression of legal matters is usually all any non-lawyer grasps … it’s just too hard to understand the subtleties of legal text, and we rely on trusted intermediaries to explain what’s what. Google is trusted, and they’re misusing that trust with communities, NGOs, and governments. And Google has huge resources, they get a lot of attention. They’re representing their mapping offerings as free and open, when they’re ultimately controlled by their business concerns. Google has one of the slickest communication practices around, with subtle phrasing that gives an impression of cooperation, but with built in protection whenever someone digs into the details. This is deceptive. There’s no problem with copying, it’s encouraged. Mapping Parties are not patented. There’s no license on ideas, because fair play is expected. Simply, being a good citizen, being a friend in this diverse space, means giving credit and giving back. Google has taken a concept, adapted it, and not attributed. Not until last year did they even use the phrase Mapping Party for Map Maker events (sometimes that got the attention it deserved). In places where there’s been exposure, Google didn’t “throw Mapping Parties”, because of course it would’ve been noticed as deriving from OSM. And Google is alergic to giving any notice to OSM, for example omitting any mention of the biggest open data project on the planet, which originated in the UK, from their glossy magazine on UK Open Data. Competition is a very crude and inaccurate way of describing the relationships in the open data space, especially between OSM and Google, and is based on confusion of what OpenStreetMap is all about. OSM is essentially a commons, a data project where everyone can contribute, share and use. OSM is not a company, it’s not an NGO. It’s a collective where hackers, governments, universities, anarchists, slum dwellers, multinational corporations, and international organizations all contribute to a common endeavor to map the world. Every other major internet company contributes to OSM in some substantial way. It is Google only that has decided it’s in competition with OSM, not because of the designs of engineers and product people, but because doing so would undermine something Google thinks it can profit from. Honestly, I would be thrilled to see Google adopt the use of OSM. The data of OSM is very different from the interfaces and the software. The openstreetmap.org site and tools definitely need improvement, but it’s not because osm.org wants to take away traffic from Google Maps. OSM’s frontpage needs to do something different: “The frontpage fails to communicate what the project does and why it does it effectively. The controls are confusing for new users (lots of random tabs and sidebar). In addition, it totally fails to connect new users to others around them and thus create a community.” Google could even be helping with this. It is okay to have issues with Google. Google is a big place; there are a lot of different people and different teams here, all trying to accomplish different things. It’s tough to assign a coherent intent to the entire company; we’re a bunch of people trying to work together even though we don’t always agree. No individual person is trying to be evil. Sometimes we screw up, though. So yea, I’m pissed off, and can’t keep quiet. And actually, as some have asked, there is a lot more to these stories that you’ll only here about over a beer. If you only know me by this post, perhaps you’re surprised to hear that I’m usually known as a mediator, diplomatically open to all sides of an issue, generally a nice guy who just wants to map the world. And in case it wasn’t obviously clear, this all is my personal opinion. Another aspect of our open world is our multiple public representations, and I wasn’t speaking for the OSM Foundation, Humanitarian OSM Team, or GroundTruth. And yes, the OpenStreetMap community has a reputation for being “caustic”, which is based on a very small segment of our community, mostly the osm-talk list. Anyone who has ever attended State of the Map, gone to a pub meet, contributed to a HOT response, posted to nearly any other list, will have a different impression. Finally, I regret to say that Unosat got caught in the cross-fire of this post. Unosat has an evolving cooperation with many entities, including HOT, where we have been given access to imagery in Japan and Liberia. While I find fault with their Google MapMaker cooperation, they aren’t giving Google any data, rather using Google data. They are well versed in the details of open data, of licensing, and are wise to explore opportunities equally. They’ve generously explored how they can work together with OSM, most recently in Japan and I look forward to more. Nicolas Chavent and Dane Springmeyer are now on Haitian soil for HOT. It was just a few weeks ago that Nicolas and Robert returned from the first HOT mission to Haiti. Nicolas had the immediate conclusion … we have to go back. Something amazing was started with OSM and an interesting cross section of CNIGS (the Haitian national mapping agency), the UN, and civil society. The work had to be seen through, and Nicolas is dedicated for the long term. He’s joined now by Dane, adventurous and incredibly skilled technically. Can’t wait to see what develops this trip, and immensely proud that OSM is again on the ground in Haiti. Our greatest thanks go to the World Bank, and especially the Disaster Risk Management group. They are funding this mission, and the next in June. Besides continuing to support the Haitian government in recovering from the quake, the Bank is particularly interested in how OSM can be used in future risk assessment, particularly vulnerable buildings. This mission in Haiti will continue the discussion. As HOT is still a developing entity, we are also thankful to OpenGeo for providing a vehicle to move so quickly, and to MapAction for sharing their view on assessing risk and insurance. HOT’s work in Haiti is all about continuing the open environment of sharing that developed in the immediate response to the quake. In dedication to that openness, and give a small taste of what it takes to go to Haiti, here is the instruction sent by Nicolas to Dane for guidance on his arrival in Port au Prince. I haven’t seen anything like this practical advice posted online before, so here it is. ** Baggage pick up: baggage will brought to the baggage pick up area from the plane by the Airport personnels (all is handled by hands). In principle the baggage pick up area is restricted to airport personnels only & you are supposed to raise their attention to get your luggage. French for this will He ce bagage (look-up in dictionary for baggage items which are not backpack/ SAC A DOS or suitcase/ VALISE & COLORS, so that you can designate your pieces). Things in practice are more fluid: I managed like many others Haitian to get my stuff personally at the cost of not building friendship which is ok.
*** Do not exit the airport area unless you are with a Westerner in a car who will drop you at the main entry of the UN Logistics Base (LogBase). Prepare for the unlikely to happen worst case scenario (no pickup) while you are on plane and/ or through the baggage collection process and identify Westerners working in LogBase or in PAP who could offer you a lift to LogBase. This could be the only option for you to exit the Airport in a car with Westerner. *** If no westerner, no car, no dirver, then stay at the airport and be hyper patient and calm until pick up finally comes or that I arrive and I hope we will get things sorted out. ** both IOM & WFP are located in the UN Logistic Base (LogBase) which is lierally at the end of the runway of the international airport Toussaint Louverture. LogBase is a separate spatial entity from the public international airport which is under the control of the various national air forces of the MINUSTAH (the UN peace keeping mission in Haiti) & consequently you access it from a secured entry point relatively open to Westerners furnished with IDs. *** if IOM is not impressive enough, then make the name of WFP (the Head of Programes in WFP and a friend). I am not 100% sure I”ll manage to get my phone in my commute (train to airport) in Paris since the friend who as it as well as my ext hard drive is likely to be at the maternity welcoming a child… So your iphone (if a SIM card can be loaded in can do good, alternatively if you have an old mobile close to be trashed but functional enough to do text messages & talking it would be worthy to have it with you). The State of the Map Scholarship program’s wider objective is to support nascent OpenStreetMap communities by building connections and exposing ideas. The application process is in full swing for 2010, so it’s a good time to look back at the effect 2009 has had on participants. It’s also required as a final report for OSI! Following SOTM 2009, I took a look forward at what could start to happen. The kinds of things in mind were GPS loans (GPS are still hard to come by and expensive in some places), mapping in marginal and conflict areas, access to satellite imagery, localisation of software and tiles, organization of local chapters, and promotional activities. We also had funds for select follow up activities with some of the participants, to build on promising leads in these areas. 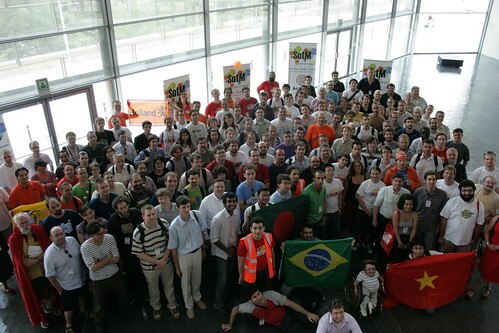 Everyone invited in 2009 is still very involved in OpenStreetMap, probably more so … these are true believers. Like Arlindo says, “I donâ€™t think on OpenStreetMap as a hobby anymore” … it’s more of a way of life. Local chapters made progress. Well, the Foundation is still working to come up with a legal agreement that will work in jurisdictions across the globe (just a little complicated), but that hasn’t stopped local groups from formalizing anyhow. Khan Le has helped form a Vietnam OSGeo local chapter (which can also work as an OSM local chapter), as well as holding mapping parties in Hanoi and Saigon. Fredy Rivera in Columbia used part of his follow up funds to establish a Columbia OSM chapter. Backed by the follow up funds, I actually pushed Latin America as a whole to come together as a chapter, considering the small communities last year, but it was harder to coordinate the decision making at this scale; things have grown anyhow, and along more national lines. Giorgi was able to take part in a massive local push, by joining the Open Maps Caucasus initiative. He met Jeff Haack at SOTM, the coordinator for the OMC project with JumpStart International. They started there in some of the conflict affected regions in the recent Georgia-Russia conflict. Abdel in Cairo is sees SOTM 2009 as a key instrument for moving forward in Egypt and may have more to say soon on plans there. In Cuba, PB kept things moving well despite difficulties like the illegality of GPS, and a failed attempt to get spare servers from Wikimedia (illegal to distribute from the US). 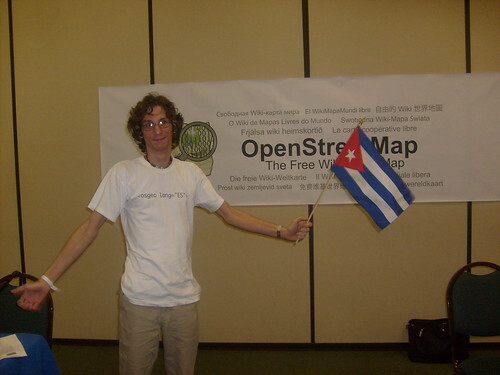 He used his follow up funds to attend an SDI meeting in Panama and wave the flag for open data. OSM is increasingly being seen as a core component in national scale Spatial Data Infrastructures in many countries, and PB’s work in Panama made a great push on this issue. Everyone still sites the major need for GPS units. Brazil used its follow up funds for a GPS loan program, and just distributed the first of the units. Julio in Chile used funds to purchase GPS units also but within the dire emergency of the Chilean earthquake. Despite the difficult times there, OSM has continued strongly. Columbia has also been contributing to the relief effort in Chile, and Haiti. Pushing for cross border collaborations doesn’t necessarily work. Though everyone gets along wonderfully, OSM is still seen often through nation state boundaries. So as in Latin America, the same in the even trickier relationship between India and Pakistan. Professor Rai in Ludhiana has done amazing work, including an impactful effort to map the enterity of Gill village. 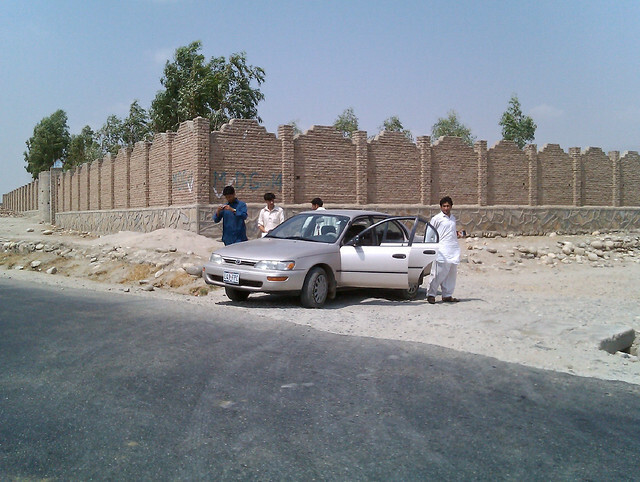 Across the border, in Multan, Professor Rasul has been pushing ahead in the pursuit of open mapping. The follow up grants to them were meant to both strengthen their own programs, and encourage them to collaborate across that difficult border, as both lie within the former region known collectively as Punjab. Map Punjab is intended to be a site with localizations, in both language, national borders, and historic borders, as well as a point of technical and social collaboration. So far, it hasn’t materialized. Some things take longer to brew. Elsewhere in India, Arun Ganesh does lament the long gestation of OpenStreetMap in India, though his strategy to increase visibility seems wise. Rather than focus on open data in the extract, he’s producing beautiful maps, especially of transit systems, that are only now possible with OSM data. Nic Roets is taking a similar tack in South Africa cooperating on mapping World Cup venues. Finally, Ciprian in Romania is collaborating with companies using OpenStreetMap. So, different stories all over, but the same core story is individuals energized by the experience of SOTM, growing OSM naturally and with purpose. Can’t wait to see what’s next, and especially who’s coming in 2010, and what might develop from there. What would it take to map an entire country? With the growing visibility of Map Kibera, that question is coming more frequently, especially in Africa, where both OpenStreetMap and traditional mapping are widely absent. This is a massive question, which is going to depend very much on circumstances of that country, and on who is asking that question; and in the end may be better answered by a different question. In response to a couple queries, from Liberia and Malawi, I decided to write up a few blog posts to start off those conversations, and serve as reference for any of the other 200+ countries on this planet. To start, going look at a few examples to serve as models for answering the question. Up front, the question assumes one very important thing; the historical growth pattern of OSM isn’t happening. Traditionally, a few individuals had their minds blown by a conference presentation on OSM, or maybe a random blog post somewhere, and they start mapping their home town. And when that looks to be a big task, and they start eyeing the next town, they start recruiting others through mapping parties. A mailing list is set up. The virus starts to spread, and OSM might get the attention of a local government or two, maybe some companies, and soon, the country is well on its way to being mapped. The growth is organic. It might take years. The preconditions are important. Roughly, there has been an active community already of technically proficient people who have leisure time, perhaps already contributing to open source projects. In other countries, there may not be a technical community, or socioeconomic conditions make leisure time a valuable and scarce. Other places may be in conflict. These are places where people start to consider intentional interventions to get mapping going. The first place I took part in an intentional effort was India. Now, India is well known for having a broad and highly skilled technical base, but at least in 2008, there was proportionally small open source community. There had been interest in mapping through the Free Map project, and Schuyler and I took the invitation to promote OSM through a slightly insane schedule of mapping parties in 7 Indian cities in one month. A wonderful experience. But it did not instantly translate into a frenzy of mapping activity. The idea gestated for a time, and slowly, individuals took up the cause, and now the OSM India community is vibrant, centered in cities. 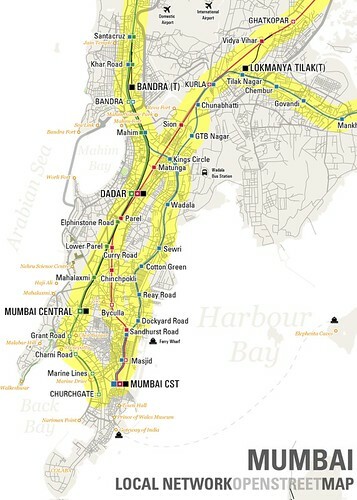 One place to note is Mumbai, despite extensive interest, is still not active, largely due to an import of AND data that turned out to be much less than accurate, discouraging further editing. An issue we’re still looking at, and generally, I’ll talk about existing data sources and imports in another post. Palestine was a very intentional mapping, first of the entire West Bank, and then of Gaza. JumpStart International funded a project to create a complete, public domain map of all roads. We estimated a time of about 6 months, which turned out to be accurate (more on time estimates in another post). The approach taken was to hire engineering graduates, in teams based in each region, train them through mapping parties, and coordinate the incoming data. Gaza was not to be mapped, but the 2009 crisis there motivated the remote OSM community to fund raise to purchase recent satellite imagery of the entire strip, and trace remotely. After the conflict was over, JumpStart entered Gaza and built up a team to enhance that work with a combination of GPS tracing and imagery. The result is a complete road map of Palestine. However, no sustained OSM community of interested individuals, local companies, local government, and UN agencies is left. The individuals involved saw this as temporary paid work, and many of them have taken jobs outside Palestine. The wider community wasn’t engaged with an aim to build capacity. So now, even though Israeli OSM has been interested to hold joint activities with Palesinte, and Ramallah now has street names, the map isn’t being updated. In Kenya, we haven’t set out to map the entire country, but it seems like the base we’ve built in Kibera is ready to spread throughout Nairobi and beyond. We’ve focused heavily on Kibera, but with the idea always that the group here, and the entire community, will be able to take the project forward. The impact of mapping a place that was unmapped, and considered unmappable, has made a great impression within civil society, the government, and the UN. We’ve taken a lot of time to outreach to others already working with map data. The approach is more like planting a single seed, nurturting it, and then allowing it to grow. It’s yet to be seen how this pans out. JumpStart started next working in Georgia. Their approach is now long term but different. They have first focused on conflict areas, following the Georgia-Russia conflict in Abkhazia and South Ossetia, and also in the capital, Tbilisi. From this start, they are building a country wide network of regional offices, Open Maps Caucasus, supported by an NGO structure. They are producing curriculum, hiring a team, and doing extensive outreach with map data users. The question to my mind is the long term sustainability of the structure. If JumpStart decides to stop supporting the NGO structure, will it be able to find more funding to keep going? And if that doesn’t materialize, will a community be in place to take it forward organically? Again, yet to be seen, and a question they are certainly considering. In the USA, mapping hadn’t taken off until last year. This was perhaps due to the TIGER data set, available public domain. CloudMade set out to initiate this community by hiring community ambassadors in regions throughout the country, and holding mapping parties. One of the most spectacular was the Atlanta mapping weekend, involving hundreds of people in cooperation with the Atlanta municipal government. However, after a time CloudMade discontinued the ambassadors program. From there, what has developed has looked like a more traditional growth, with a wide spectrum of individuals, companies, organizations, and government getting interested and involved. The GeoDC group has been very active, and recently OSMF US has incorporated. Hard to calculate what effect the intentional effort of CloudMade had on this growth, though it was certainly a contribution. Finally, many have seen the extremely rapid growth of the map in Haiti. Prior to the quake, very little data existed there for familiar reasons. Following the disaster, and the release of imagery for derived works and other data sources, remote mappers quickly and spectacularly produced comprehensive maps of Port au Prince and much of the country. Mappers wanted to contribute to the relief effort. Certainly in other unmapped places, remote mappers are motivated to contribute just out of interest. If you look at any capital city covered by Yahoo imagery, there will have been remote mappers contributing at least geometries. Does this translate to places not in crisis, but in more prolonged issues that prevent mapping? Probably to some extent, but not nearly as focused and quick, and very much dependent on imagery. But imagery is not enough. Local knowledge is needed to name places, and identify features … most roofs don’t tell you what’s going on inside a building. In Haiti, two deployments have gone to advocate, train, and build capacity for OSM locally. Nicolas is now planning to go again, as part of our long term plan for OSM in Haiti, to continue the work to the point where the Haitian community, which includes their government and civil society actors, are ready to take it forward. Author mikelPosted on April 28, 2010 April 29, 2010 Categories openstreetmap4 Comments on What would it take to map an entire country? This weekend, Nicolas Chavent and Robert Soden will deploy to Haiti for the Humanitarian OpenStreetMap Team. MapAction and OCHA are facilitating this mission, with generous support from the European Commission Humanitarian Aid Department — many thanks to MapAction and ECHO for helping to make this happen. Nicolas and Robert are a dream team for this work, adventurous and passionate map makers. They are joined by experienced MapAction volunteer Chris Philips. Broadly, the mission is to support use of OpenStreetMap on the ground in Haiti within groups of UN and international responders, the Haitian government, and Haitian civil society. In other words, make sure OpenStreetMap stays relevant and useful into the recovery, reconstruction, and, most crucially, long term development of Haiti. They won’t be going in alone, but with thousands of mappers globally ready to back them up. This pioneering trip has emerged from several threads. Nicolas and I identified the need in our meeting in January, and published in the HOT Haiti Strategy and Proposal. The remote response of OSM has been very effective in the initial response, with high visibility and urgent need for data sets, but as time goes on, geodata management processes are put in play on the ground, and capacity building to use OSM within those processes is very much needed. OSM has to meet these communities half way to be effective, and the only way now to really understand deeply is to go to Haiti. The second thread has been a long running discussion between MapAction and OSM. I really admire the work of MapAction; they deploy rapidly and create maps by any means necessary in the crucial first days after a disaster, all through volunteer professionals. They first used OSM in their work last year in the Philippines, and we have long wanted to learn from each in how open source and open data can be deployed in emergencies. Third thread was the incredible World Bank deployment last month; Schuyler Erle and Tom Buckley had tremendous insights and made key connections with government and the UN that we hope to build on. Wonderfully, Tom has redeployed to Haiti. Final thread is the ongoing collaboration with Ushahidi and Kartier par Kartier, and their work to build local and diaspora capacity to take the Haiti Ushahidi install on in the long term. This definitely involves base mapping, and there’s an interest in linking in our approach, and eventually Map Kibera like projects in Haiti. In detail, Nicolas and Robert will be doing hands on training and lots of conversing to assess needs and find solutions that integrate with OSM. Their work will address all levels. At the UN and international NGO level, we are blessed with many good contacts through Nicolas, MapAction, OCHA and myself, and are very eager to continue cooperation. CNIGS (Haitian national mapping agency) and CIAT (main government development coordinating body) have been working with the World Bank and others to rebuild themselves, and their capacity with new technologies; there’s interest here in really getting a solid national road network data set, with addressing. And within civil society, KpK has established an amazing grass roots network. Sabina Carlson from Ushahidi and Shadrock Roberts from KpK will also be in Haiti at the same time as the HOT mission. The preparations have been intense. We’ve spent the last month budgeting, planning travel, getting equipment sorted, discussing the plan. Haiti is still in chaos, and perhaps even more so within the international responders as their hard work goes on and on. Not certain at this moment where there’s space to throw up Robert’s and Nicolas’ tents. Nearly certainly they are landing in Port au Prince on Sunday afternoon (with risks of delays). It will be Agile at its highest. Sourcing all the appropriate equipment has been intensive … printers, computers, and GPS units are on their way down, need to perform in difficult conditions, and find a good long term home. Software and data work is ongoing, including iterations of Map on a Stick. Clear training materials, including approaches relevant to short-on-time GIS and data collectors new to OSM, are being compiled. Nicolas has spent a great deal of time on the Humanitarian Data Model. This work reconciles data models and schemas in various response sectors, maps to OSM map features, and works to engage new tools for Extract-Transform-Load processes, and JOSM presets. In other words, make OSM directly relevant to the systems already in use in Haiti. The OpenStreetMap community is invited to review and join the discussion on this process. I’m very excited for this mission, and wish the best of luck and safe travels to Nicolas and Robert. Hopefully their busy schedule will allow for some updates and documentation. We’ll be listening closely to support whatever they need from afar.